I have been getting used to listening to audio books for several months now, no, actually for almost two years now. Well, at least since all those mp3's with more space capacity limits, came out in the market i just don't listen to music anymore when i am in the car on my way to work, exercising or wandering. Hubby introduced me to audio books and since then I got hooked. But since I started taking the train to work, I noticed that there are still a lot of people who prefer to read rather than listen to audio books. I take the 4:20 a.m train from my place to the airport almost everyday now, except weekends. And each time, I noticed that most of my co-commuters, once they get themselves settled in their seats, they immediately take out their paperbacks or hardbound and start reading. Of course there are also others who read newspapers rather than books in the train. Or the younger gen group prefer to listen to music with their mp3's or iPod's. Whilst in the topic, I often wondered if these people are deaf or having hearing difficulties, since even if they have headsets on, I could also hear the noise that the are listening to. but I digress! Anyway, thing is, i started feeling out of place. HUH??? Out of place, in the train??? Yes, I don't know how or why yet I feel like an alien amongst the earthlings. Me with my big brown eyes, shiny black hair and soft and smooth brown skin, nyahahaha! Anyway, another thing I noticed was that several times already, was the same title of the book, ERAGON. I slowly wondered what was so interesting about it. Then last Christmas, I got my very own copy of the book. This was, I couldn't start on it since I was always very busy with work, trainings and more work, hehehe. Excuses, excuses! I finally finished it. While searching the net for the next serie of the book, i noticed that it has also an audio clip, this means that it is also available as audio book, hmmmnnnn.. Think, think. Below is an excerpt of the book. 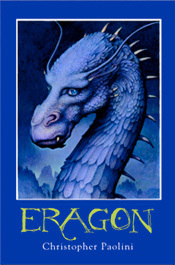 "ERAGON" by Christopher Paolini. The story about the relationship of the Elves, Dwarves, Dragons and humans in the past times in the land of Alagaesia, is very captivating. There is no boring page in it. 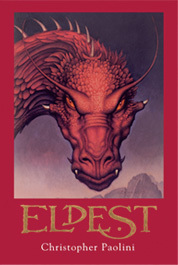 I am now thinking of getting the "ELDEST", book Two of the Inheritance Cycle. I thought I'd get the paperback version, but I am also tempted to look for the audio book version. Then I don't have to carry the book all the time which is also bulky for me. Well, I am in no rush. When I have time to spare, I might just go over to Hugendubel in the Zeil in Frankfurt am Main and look around for the same title in paperback... or if I can't find time, I may just purchase the downloadable audiobook version of the same title. Below is the audio clip of the "Elsdest". 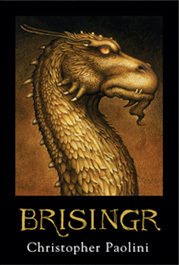 The Inheritance cycle is composed of: ERAGON, ELDEST and BRISINGR. But I couldn't find an excerpt of Brisingr as audiobook. Hence no sample here , unlike the first two.